Commission Regulation (EU) 2017/2400 (3) introduces a common method to objectively compare the performance of heavy-duty vehicles placed on the Union market as regards their CO2 emissions and fuel consumption. It lays down provisions for the certification of components with an impact on CO2 emissions and fuel consumption of heavy-duty vehicles, introduces a simulation tool for the purpose of determining and declaring CO2 emissions and fuel consumption of those vehicles and lays down, inter alia, requirements for Member States' authorities and manufacturers to verify the conformity of the certification of the components and the conformity of the simulation tool operation. The experience gained following the entry into force of Regulation (EU) 2017/2400 has led to the identification of several aspects of the common method for determination of the CO2 emissions and fuel consumption of heavy-duty vehicles, the operation of the simulation tool, the certification of components, separate technical units and systems and the procedure for the checking of conformity of the operation of the simulation tool and of the certification of components, separate technical units and systems which need clarification. Those clarifications also have an impact on the information provided by manufacturers in accordance with Directive 2007/46/EC. The Commission has carried out an assessment regarding the technical and economic implications of the necessary clarifications. The improvement of the common method to objectively compare the performance of heavy-duty vehicles in terms of CO2 emissions and fuel consumption should increase the competitiveness of Union industry and the transparency in the market as regards the fuel consumption of heavy-duty vehicles. Liquefied natural gas (LNG) is an available alternative fuel to diesel for heavy-duty vehicles. The deployment of upcoming innovative LNG-based technologies will contribute to further decrease in CO2 emissions as compared to diesel vehicles. To ensure that LNG is covered by the engine test procedure, it is appropriate to include LNG as an additional reference fuel in the certification of engines in order to determine the CO2 emissions and fuel consumption of heavy-duty vehicles. It is appropriate to take into account the specificities of vocational vehicles, i.e. vehicles that are used for other purposes than the delivery of goods. Those vehicles should therefore be attributed to specific sub-groups within the existing vehicle groups to distinguish them from vehicles that are used only for the delivery of goods and their CO2 emissions should be determined in accordance with dedicated mission profiles. It is also appropriate to clearly define those vehicles which, due to their advanced powertrains, including electric, hybrid electric and dual-fuel powertrains, cannot for the moment be subject to the requirement of determining their CO2 emissions or fuel consumption using the available simulation tool. In order to ensure a good understanding of the rate of market penetration of those vehicles, a specific procedure should be provided for to allow a clear identification of those vehicles and their respective powertrains. It is essential for achieving CO2 reductions that the CO2 emissions of newly produced heavy-duty vehicles are in conformity with the values determined pursuant to Regulation (EU) 2017/2400. The conformity of the operation of the simulation tool and of the certification of the components, separate technical units and systems with an impact on CO2 emissions and fuel consumption should therefore be verified using an on-road verification testing procedure, in addition to the procedures already set out in Regulation (EU) 2017/2400. The verification testing procedure should be carried out by manufacturers and be verified by approval authorities. It should be possible for the approval authorities to impose remedial measures for any systematic irregularities with regard to the certification of CO2 emissions and fuel consumption related properties of components, separate technical units or systems and the operation of the simulation tool, including when such irregularities are identified in the course of the investigation following a vehicle failure in the verification testing procedure. If the approval authorities find no irregularities with regard to the certification of CO2 emissions and fuel consumption related properties of components, separate technical units or systems or to the operation of the simulation tool despite the vehicle test failure, it should be possible for the Commission to examine a potential malfunction of the simulation tool. During the verification testing procedure, the wheel torque, engine speed, engaged gear and fuel consumption of the heavy-duty vehicle should be measured on the road, close to the simulation tool mission profile, and compared to the fuel consumption calculated by the simulation tool. For a successfully passed verification testing procedure, the calculated fuel consumption should correspond to the measured fuel consumption within a certain tolerance. The systematic verification of the results of a numerical simulation by a physical test is a new concept in the European type approval legislation. The underlying verification test procedure will therefore be evaluated with a view to possible improvements. The Commission and the approval authorities should therefore be authorised to collect the results of verification test procedures from manufacturers and to evaluate them. In order to ensure sufficient time for the approval authorities and manufacturers to adapt to the new provisions, the obligation to verify CO2 emissions and fuel consumption of new vehicles using the on-road verification testing procedure should be applicable as of 1 July 2020. The CO2 emissions data for vehicles falling within vehicle groups 4, 5, 9 and 10 that have been determined in accordance with Regulation (EU) 2017/2400 are to be monitored under Regulation (EU) 2018/956 of the European Parliament and of the Council (4), starting in 2019. The aim of the amendments to Regulation (EU) 2017/2400 set out in this Regulation is to ensure that reliable CO2 emissions data can be collected for all the vehicles concerned by Regulation (EU) 2018/956 for 2019. It is therefore important to ensure that the amendments set out in this Regulation enter into force without delay. ‘6. In the case of ZE-HDVs, He-HDVs and dual-fuel vehicles, the simulation tool input data shall include the information set out in Table 5 of Annex III. ‘8. The standard value for tyres shall be the one for C3 snow tyres as set out in Table 2 of Part B of Annex II to Regulation (EC) No 661/2009 of the European Parliament and of the Council (*1). (*1) Regulation (EC) No 661/2009 of the European Parliament and of the Council of 13 July 2009 concerning type-approval requirements for the general safety of motor vehicles, their trailers and systems, components and separate technical units intended therefor (OJ L 200, 31.7.2009, p. 1).’;"
‘Where a vehicle fails the verification testing procedure set out in Annex Xa, the approval authority shall start an investigation to determine the cause of that failure, in accordance with Annex Xa. As soon as the approval authority determines the cause of the failure, it shall inform the approval authorities of the other Member States thereof. If the cause of the failure is linked to the operation of the simulation tool, Article 21 shall apply. If the cause of the failure is linked to the certified CO2 emissions and fuel consumption related properties of components, separate technical units and systems, Article 23 shall apply. a new Annex Xa is inserted as set out in Annex X to this Regulation. Annexes I, IV and IX to Directive 2007/46/EC are amended in accordance with Annex XI to this Regulation. Article 2 shall apply as of 1 September 2019. Done at Brussels, 19 February 2019. (3) Commission Regulation (EU) 2017/2400 of 12 December 2017 implementing Regulation (EC) No 595/2009 of the European Parliament and of the Council as regards the determination of the CO2 emissions and fuel consumption of heavy-duty vehicles and amending Directive 2007/46/EC of the European Parliament and of the Council and Commission Regulation (EU) No 582/2011 (OJ L 349, 29.12.2017, p. 1). (4) Regulation (EU) 2018/956 of the European Parliament and of the Council on the monitoring and reporting of CO2 emissions from and fuel consumption of new heavy-duty vehicles (OJ L 173, 9.7.2018, p. 1). Engine stop-start during vehicle stops: system which automatically shuts down and restarts the internal combustion engine during vehicle stops to reduce engine idling time. For automatic engine shut down the maximum time delay after the vehicle stop shall be not longer than 3 seconds. Eco-roll without engine stop-start: system which automatically decouples the internal combustion engine from the drivetrain during specific downhill driving conditions with low negative gradients. During these phases the internal combustion engine is operated in engine idling. The system shall be active at least at all cruise control set speeds above 60 km/h. Eco-roll with engine stop-start: system which automatically decouples the internal combustion engine from the drivetrain during specific downhill driving conditions with low negative slopes. During these phases the internal combustion engine is shut down after a short time delay and keeps shut down during the main share of the eco-roll phase. The system shall be active at least at all cruise control set speeds of above 60 km/h. Approaching a crest the vehicle velocity is reduced before the point where the vehicle starts accelerating by gravity alone compared to the set speed of the cruise control so that the braking during the following downhill phase can be reduced. During downhill driving with a low vehicle velocity and a high negative slope the vehicle acceleration is performed without any engine power usage so that the downhill braking can be reduced. During downhill driving when the vehicle is braking at the overspeed velocity, PCC increases the overspeed for a short period of time to end the downhill event with a higher vehicle velocity. 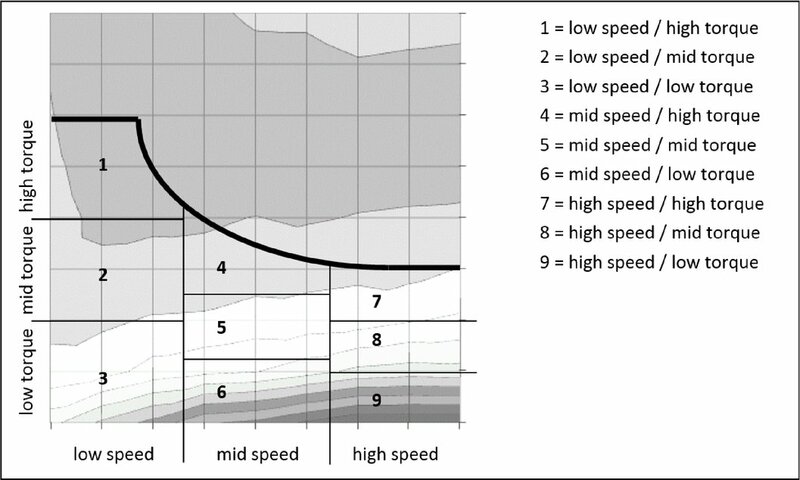 Overspeed is a higher vehicle speed than the set speed of the cruise control system. A PCC system can be declared as input to the simulation tool if either the functionalities set out in points (1) and (2) or points (1), (2) and (3) are covered. Any advanced driver assistance system declared in the input into the simulation tool shall by default be set to fuel economy mode after each key-off/key-on cycle. If an advanced driver assistance system is declared in the input into the simulation tool, it shall be possible to verify the presence of such a system based on real world driving and the system definitions as set out in point 8.1. If a certain combination of systems is declared, also the interaction of functionalities (e.g. predictive cruise control plus eco-roll with engine stop-start) shall be demonstrated. In the verification procedure it shall be taken into consideration, that the systems need certain boundary conditions to be “active” (e.g. engine at operation temperature for engine stop-start, certain vehicle speed ranges for PCC, certain ratios of road gradients with vehicle mass for eco-roll). The vehicle manufacturer needs to submit a functional description of boundary conditions when the systems are “inactive” or their efficiency is reduced. The approval authority may request the technical justifications of these boundary conditions from the applicant for approval and assess them for compliance.’. If dn44 is smaller than or equal to (dn35 + 5) and also smaller than or equal to (dn53 + 5), the 6 additional target engine speeds shall be determined by dividing each of the two ranges, one from nidle to nA and the other from nB to n95h, into 4 equidistant sections. If (dn35 + 5) is smaller than dn44 and also dn35 is smaller than dn53, the 6 additional target engine speeds shall be determined by dividing the range from nidle to nA into 3 equidistant sections and the range from nB to n95h, into 5 equidistant sections. For diesel engines, the limit values for the assessment of conformity of one single engine tested shall be the target value determined in accordance with point (6) + 4 percent. 1.5. In the case that the certification in accordance with this Regulation is granted at the same time as the type approval for an engine as separate technical unit in accordance with Regulation (EU) No 582/2011, the marking requirements laid down in point 1.4 may follow, separated by “/”, the marking requirements laid down in Appendix 8 to Annex I to Regulation (EU) No 582/2011. If the average logging frequency of the engine speed of the originally recorded full load curve is smaller than 6, the conversion is performed by arithmetical averaging over intervals of ± 4 min– 1 of the given setpoint for the output data based on the full load curve input in originally recorded resolution. If the average logging frequency of the engine speed of the originally recorded full load curve is greater than or equal to 6, the conversion is performed by linear interpolation based on the full load curve input in originally recorded resolution.’. In case of a tandem axle, the combined torque loss map for both axles shall be calculated out of the test results for the single axles at the input side. The input torques shall also be added. If a torque loss measurement in accordance with points 6.1(a) or (b) is conducted, the average efficiency of the tested axle during conformity of the certified CO2 emissions and fuel consumption related properties procedure shall not be lower than 1,5 % for SR axles and 2,0 % for all other axles lines below the corresponding average efficiency of the type approved axle. The vehicle chassis shall fit to the dimensions of the standard body or semi-trailer as defined in Appendix 4 of this Annex. ‘In case it is not possible to maintain high speed for a complete round, e.g. due to curves being too narrow, it is allowed to deviate from target speed requirement during the curves, including the nearby straight portions that are needed for slowing down and accelerating the vehicle. Deviations shall be minimized as far as possible. General remark: For simulation tool input data an electronic file format needs to be defined which can be used for data import to the simulation tool. The simulation tool input data may differ from the data requested in the information document and vice versa (to be defined). A data file is especially necessary wherever large data such as efficiency maps need to be handled (no manual transfer/input necessary). This Appendix describes the list of parameters to be provided by the vehicle manufacturer as input to the simulation tool. The applicable XML schema as well as example data are available at the dedicated electronic distribution platform. The XML is automatically generated by the air drag pre-processing tool. Final result of the air drag pre-processing tool. CdxA_0 transferred to related families in other vehicle groups in accordance with Table 16 of Appendix 5. In case no transfer rule was applied CdxA_0 shall be provided. In case standard values in accordance with Appendix 7 shall be used in the simulation tool, no input data for air drag component shall be provided. The standard values are allocated automatically in accordance with the vehicle group scheme. ‘Application related power consumptions at engaged PTO are added by the simulation tool and are not described in the following.’. This Annex sets out the requirements for the verification testing procedure which is the test procedure for verifying the CO2 emissions of new heavy-duty vehicles. The verification testing procedure consists of an on-road test to verify the CO2 emissions of new vehicles after production. It shall be carried out by the vehicle manufacturer and verified by the approval authority that granted the licence to operate the simulation tool. During the verification testing procedure the torque and speed at the driven wheels, the engine speed, the fuel consumption, the engaged gear of the vehicle and the other relevant parameters listed in point 6.1.6 shall be measured. The measured data shall be used as input to the simulation tool, which uses the vehicle-related input data and the input information from the determination of the CO2 emissions and fuel consumption of the vehicle. For the verification testing procedure simulation, the instantaneously measured wheel torque and the rotational speed of the wheels as well as the engine speed shall be used as input, as described in Figure 1 instead of the vehicle speed, in accordance with point 6.1.6. The fan power during the verification testing procedure shall be calculated in accordance with the measured fan speed. The measured fuel consumption shall be within the tolerances set out in point 7 and compared to the fuel consumption simulated with the verification data set to pass the verification testing procedure. As part of the verification testing procedure, the correctness of the vehicle input data set from the certification of CO2 emissions and fuel consumption related properties of the components, separate technical units and systems shall also be reviewed to check the data and the data handling process. The correctness of the input data relating to components, separate technical units and systems relevant for air drag and for rolling resistance of the vehicle shall be verified in accordance with point 6.1.1. “crosstalk” means the signal at the main output of a sensor (My), produced by a measurand (Fz) acting on the sensor, which is different from the measurand assigned to this output; the coordinate system assignment is defined in accordance with ISO 4130. The vehicles for verification test shall be selected out of the vehicles from the production line for which a value of CO2 emissions and fuel consumption has been determined and declared in accordance with Article 9. The components, separate technical units or systems mounted in or on the vehicle shall be out of series production and shall correspond to those mounted at production date of the vehicle. The vehicle selection shall be made by the approval authority that granted the licence to operate the simulation tool based on proposals from the vehicle manufacturer. Only vehicles with one driven axle shall be selected for verification test. It is recommended to include in each verification test relevant data set engine, axle and transmission with highest sales numbers per manufacturer. The components, separate technical units or systems may be tested all in one vehicle or in different vehicles, under the condition that each component is covered by minimum one verification test on one vehicle. Vehicles which use standard values for CO2 certification of their components, separate technical units or systems instead of measured values for the transmission and for the axle losses shall not be selected for the verification test as long as vehicles complying with the requirements in points a) to c) and using measured loss maps for these components, separate technical units or systems in the CO2 certification, are produced. The vehicle manufacturer shall finalize the verification test within a period of 10 months after the date of selection of the vehicle for the verification test. Each vehicle for the verification test shall be in series conditions as typically delivered to the customer. No changes in hardware such as lubricants or in the software such as auxiliary controllers are allowed. Run in of the vehicle is not mandatory. If the total mileage of the test vehicle is less than 15 000 km, an evolution coefficient for the test result shall be applied as defined in point 7. The total mileage of the test vehicle shall be the odometer reading at start of the fuel consumption measurement. The maximum mileage for the verification testing procedure shall be 20 000 km. All lubricants shall be in line with the series configuration of the vehicle. For the fuel consumption measurement as described in point 6.1.5, reference fuel as set out in point 3.2 of Annex V shall be used. The fuel tank shall be full at start of the fuel consumption measurement run. All laboratory reference measurement equipment, used for calibration and verification, shall be traceable to national (international) standards. The calibration laboratory shall comply with the requirements of ISO 9000 series and either ISO/TS 16949 or ISO/IEC 17025. The calibrated range shall be at least 10 000 Nm; the measurement range shall cover the entire range of torque occurring during the verification testing procedure of the tested vehicle. The drift shall be measured during the verification test described in point 6 by zeroing the torque measurement system in accordance with point 6.1.5 after the pre-conditioning phase by lifting the axle and measuring the torque at lifted axle directly after the verification test again. For a valid test result a maximum drift of the torque measurement system over the verification testing procedure of 150 Nm (sum of both wheels) shall be proven. The vehicle speed shall be used for possible plausibility checks of the gear signal later on and shall be based on the CAN signal. The engaged gear does not need to be measured but shall be calculated by the simulation tool based on measured engine speed, the vehicle speed and the tyre dimensions and transmission ratios of the vehicle in accordance with point 7. The gear position may be provided also from the CAN signal to check possible deviations from the gear position calculated by the simulation tool. In case of deviations of the gear position in more than 5 % of the test duration, the reasons for the deviation shall be investigated and reported by the vehicle manufacturer. The input data on gear position shall be used in the simulation tool to compute the gear dependent losses in the gear box. The engine speed shall be taken by the simulation tool from the input data as defined in point 5.4. The signal from the connection with the vehicle electronic control unit via the open on-board diagnostic interface shall be used to measure the engine speed. Alternative measurement systems are allowed if they fulfil the requirements set out in Table 2. The measurement system for the rotational speed of left and right wheel at the driven axle for the assessment of the power demand at the wheels as input to the simulation tool for the verification test simulation shall fulfil the requirements set out in Table 2. The CAN signal for the fan speed may be used, if available. Alternatively an external sensor fulfilling the requirements set out in Table 2 may be used. Measurement of fuel mass. The fuel measuring device shall fulfil the accuracy requirements set out in Table 2 for the fuel mass measurement system. Total number of samples in measurement. Density of the fuel used for the verification test in (kg/m3). The density shall be determined in accordance with Annex IX of the Regulation (EU) No 582/2011. If diesel fuel is used in the verification test, also the average value of the density interval for the reference fuels B7 in accordance with Annex IX of the Regulation (EU) No 582/2011 may be used. Temperature correction factor (0,001 K– 1). actual mass of the vehicle with payload. All data shall be recorded at least in 2 Hz frequency or at recommended frequency from the equipment maker, whichever is the higher value. The torque and rotational speed at the wheels shall be recorded in one data-logging system. If different data-logging systems are used for the other signals, one common signal, such as vehicle speed, shall be recorded to ensure correct time alignment of the signals. The accuracy requirements set out in Table 2 shall be met by all measurement equipment used. Any equipment not listed in Table 2 shall fulfil the accuracy requirements set out in Table 2 of Annex V.
The maximum calibration values shall be at least 1,1 times the maximum predicted value expected during all test runs for the respective measurement system. For the torque measurement system the maximum calibration may be limited to 10 kNm. Accuracy given shall be met by the sum of all single accuracies in the case more than one scale is used. The vehicle shall be taken from the series production and selected as set out in point 3. The manufacturer's records file for the vehicle selected shall be used as basis for validating the input data. The vehicle identification number of the vehicle selected shall be the same as the vehicle identification number in the customer information file. Upon request by the approval authority that granted the licence to operate the simulation tool, the vehicle manufacturer shall provide, within 15 working days, the manufacturer's records file, the input information and input data necessary to run the simulation tool as well as the certificate of CO2 emissions and fuel consumption related properties for all relevant components, separate technical units or systems. If requested by the approval authority that granted the licence to operate the simulation tool, a verification of the corrected actual mass of the vehicle shall be included into the verification of input data. For the verification of the mass, the mass in running order of the vehicle shall be verified in accordance with point 2 of Appendix 2 to Annex I to Regulation (EC) No 1230/2012. In case of discrepancies in the certification number or the cryptographic hash of one or more files regarding the components, separate technical units or systems listed in subpoints (d)(i) to (vii) of point 6.1.1.1 the correct input data file fulfilling the checks in accordance with points 6.1.1.1 and 6.1.1.2 shall replace the incorrect data for all further actions. If no complete input data set with correct certificates of CO2 emissions and fuel consumption related properties is available for the components, separate technical units or systems listed in subpoints (d)(i) to (vii) of point 6.1.1.1 the verification test shall end and the vehicle fails the verification testing procedure. After the validation of input data in accordance with point 6.1.1, a run in phase up to maximum 15 000 km odometer reading may take place, with no need to use the reference fuel, if the odometer reading of the vehicle selected is below 15 000 km. In case of damage of any of the components, separate technical units or systems listed in point 6.1.1.1, the component, separate technical units or systems may be replaced by an equivalent component, separate technical units or systems with the same certification number. The replacement shall be documented in the test report. All relevant components, separate technical units or systems shall be checked before the measurements to exclude unusual conditions, such as incorrect oil fill levels, plugged air filters or on-board diagnostic warnings. All measurement systems shall be calibrated in accordance with the provisions of the equipment maker. If no provisions exist, the recommendations from the equipment maker shall be followed for calibration. After the run in phase, the vehicle shall be equipped with the measurement systems set out in point 5. Tractors of the vehicle groups defined in Table 1 of Annex I shall be tested with any type of semitrailer, providing the loading defined below can be applied. Rigid lorries of the vehicle groups defined in Table 1 of Annex I shall be tested with trailer, if a trailer connection is mounted. Any body type or other device to carry the loading set out below can be applied. The bodies of the vehicles may differ from the standard bodies set out in Table 1 of Annex I for the certification of CO2 emissions and fuel consumption related properties of component, separate technical units or systems. The vehicle payload shall be at minimum to a mass leading to a total test weight of 90 % of the maximum gross combined weight or gross vehicle weight for rigid lorries without trailer. The tyre inflation pressure shall be in line with the recommendation of the manufacturer. The tyres of the semitrailer may differ from the standard tyres set out in Table 2 of Part B of Annex II to Regulation (EC) No 661/2009 for the CO2 certification of tyres. All settings influencing the auxiliary energy demand shall be set to minimum reasonable energy consumption where applicable. The air conditioning shall be switched off and venting of the cabin shall be set lower than medium mass flow. Additional energy consumers not necessary to run the vehicle shall be switched off. External devices to provide energy on board, such as external batteries, are allowed only for running the extra measurement equipment for the verification testing procedure listed in Table 2 but shall not provide energy to serial vehicle equipment. A particle filter regeneration may be initiated and shall be achieved before the verification test. If an initiated particle filter regeneration cannot be achieved before the verification test, the test is invalid and shall be repeated. The route selected for the verification test shall fulfil the requirements set out in Table 3. The routes may include both public and private tracks. No specific pre-conditioning of the vehicle is required. Before the fuel consumption measurement starts, the vehicle shall be driven for warm up as set out in Table 3. The warm up phase shall not be considered in the evaluation of the verification test. Zeroing of the torque measurement equipment shall follow the instruction of the equipment maker. It shall be ensured for zeroing, that the torque on the driven axle is zero. For zeroing, the vehicle shall be stopped directly after the warm up phase and zeroing shall be performed directly after the vehicle stop to minimise cool down effects. Zeroing shall be finished within less than 20 minutes. The fuel consumption measurement shall start directly after the zeroing of the wheel-torque measurement equipment at vehicle stand still and engine idling. The vehicle shall be driven during the measurement in a driving style avoiding unnecessary braking of the vehicle, gas pedal pumping and aggressive cornering. The setting for the electronic control systems which is activated automatically at vehicle start shall be used, and gear shifts shall be performed by the automated system if applicable. If only manual settings for the electronic control systems are available, the settings leading to higher fuel consumption per kilometre shall be selected. The duration of the fuel consumption measurement shall be within the tolerances set out in Table 3. The fuel consumption measurement shall end also at vehicle stand still in idling condition directly before the measurement of the drift of the torque measurement equipment. Directly after the fuel consumption measurement, the drift of the torque measurement equipment shall be recorded by measuring the torque at the same vehicle conditions as during the zeroing process. If the fuel consumption measurement does not end at zero vehicle speed, the vehicle shall be stopped for the drift measurement in moderate deceleration. The boundary conditions to be met for a valid verification test are set in Table 3.
exceedance of maximum values for parameter No 3, 4, 5, 7, 8, 10, 12 in Table 3. In case of extraordinary traffic conditions, the verification test shall be repeated. The data recorded shall be reported in a constant 2 Hz signals as set out in Table 1. The data recorded at higher frequencies than 2 Hz shall be converted into 2 Hz by averaging the time intervals around the 2 Hz nodes. In case of e.g. 10 Hz sampling, the first 2 Hz node is defined by the average from second 0,1 to 0,5, the second node is defined by the average from second 0,6 to 1,0. The time stamp for each node shall be the last time stamp per node, i.e. 0,5, 1,0, 1,5 etc. The simulated fuel consumption shall be compared to the measured fuel consumption using the simulation tool. The input data set out in Table 4. The power calculated by the simulation tool by the equations of longitudinal dynamics from the measured vehicle speed and road gradient course may be used for plausibility checks to test if the total simulated cycle work is similar to the measured value. The simulation tool shall calculate the gears engaged during the verification test by calculating the engine speeds per gear at the actual vehicle speed and selecting the gear that provides the engine speed closest to the measured engine speed. The steering pump, compressor and generator shall be attributed standard values in accordance with Annex IX. All other simulation steps and data handling concerning axle, transmission and engine efficiency shall be identical to the application of the simulation tool to determine and declare the CO2 emissions and fuel consumption of new vehicles. The simulated fuel consumption value shall be the total fuel flow over the verification test relevant test distance, from the end of the zeroing after the warm up phase to the end of the test. The total verification test relevant test distance shall be calculated from the vehicle speed signal. The measured fuel consumption values shall be corrected for the net calorific value (NCV) as set out in point 3 of Annex V to calculate the verification test results. The vehicle shall pass the verification test if the ratio of corrected measured fuel consumption to simulated fuel consumption is below the tolerances set out in Table 5. For vehicle odometer reading above 15 000 km, no correction shall be applied. If a first vehicle fails the tolerances for CVTP, two more tests may be performed on the same vehicle or two more similar vehicles may be tested on request of the vehicle manufacturer. For the evaluation of the pass criterion set out in Table 5, the averages of the verification testing procedure ratio from the up to three tests shall be used. If the pass criterion is not reached, the vehicle fails the verification testing procedure. (1) Rise time means the difference in time between the 10 percent and 90 percent response of the final analyser reading (t90 – t10). (2) The accuracy shall be met for the integral fuel flow over 100 minutes.